Here’s a game to play with an adult! You'll also need a set of blank grids, or you could use the tablet-friendly Seeing Squares interactivity. 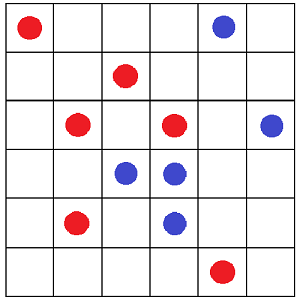 Choose a different colour for you and the adult, and take it in turns to draw a dot on the grid - the player who is drawing the blue dots will go first. The winner is the first to have four dots that can be joined by straight lines to form a square. Squares can be any size, anywhere and can be tilted. Can you work out a strategy? Justify why you think each move is a good one. How do you know when you've made a square? This game offers an excellent opportunity to practise visualising squares and angles on grids and also encourages children to look at strategies using systematic approaches. Easier version: start by drawing examples of different squares on the grid, and discuss wrong or omitted solutions. Build up gradually from a 4x4 to 5x5 to 6x6 grid. Harder version: try increasing the size of the grid. Repeat the game, aiming to find a winning strategy, then talk together about how it was found. There's a classroom version of this game here. PrimaryGames-Geometry. Cubes & cuboids. Practical Activity. Compound transformations. PrimaryGames-Number. Working systematically. Games. Interactivities. Squares. Visualising.